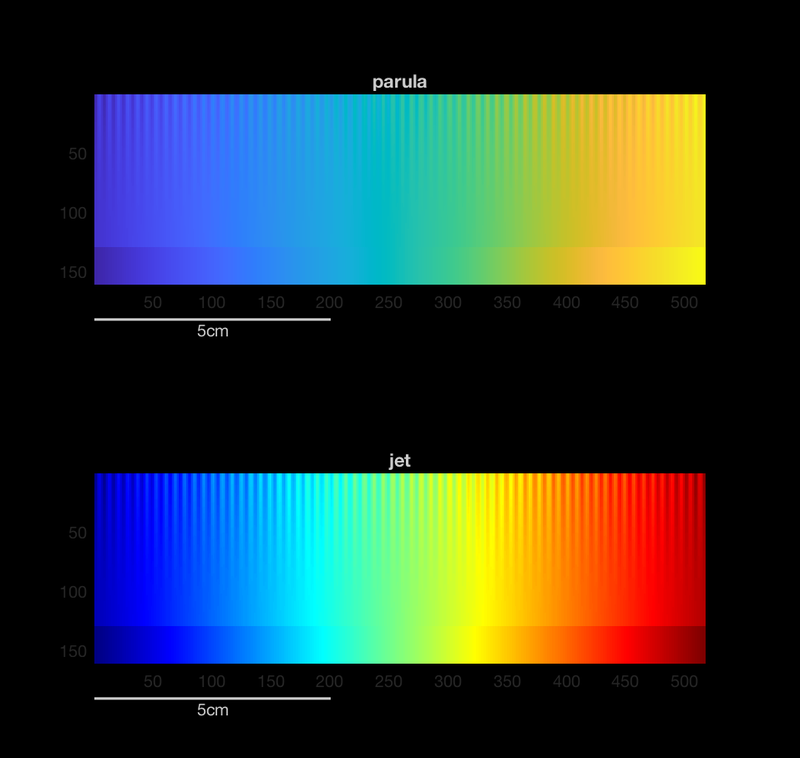 After the MATLAB R2014b release, I wrote several blog posts (Part 1, Part 2, Part 3, and Part 4) about the new default colormap, parula, that was introduced in that release. 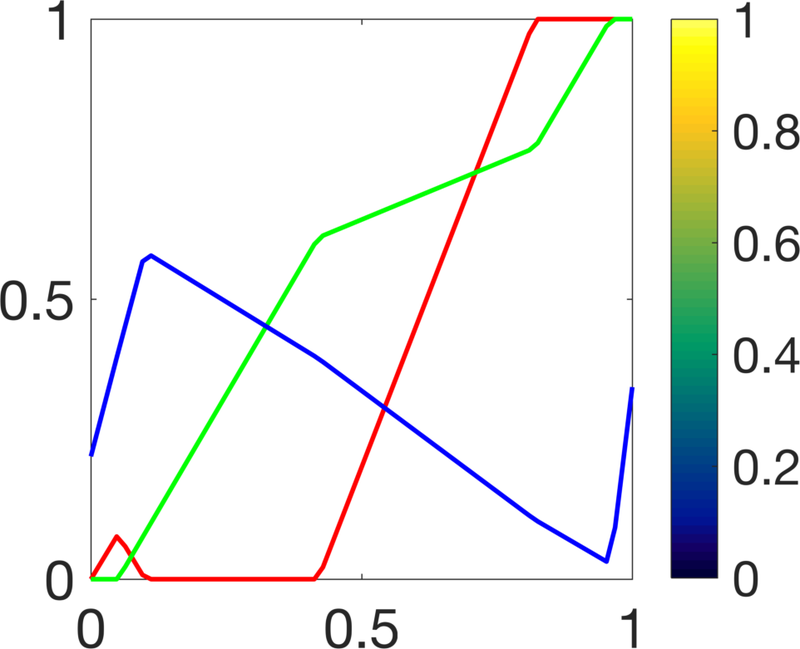 Sometime later, I came across some material by Peter Kovesi about designing perceptually uniform colormaps (or colourmaps, as Peter writes it). The image is constructed by superimposing a sinusoid on a linear ramp, with the amplitude of the sinusoid getting smaller as you move away from the top row. Here are three cross-sections of the image: row 1, row 64, and row 128. Now, vary the amplitude of the sinusoid with the square of the distance from the bottom of the image. Superimpose the sinusoid on the ramp. Finally, add a full-range linear ramp section to the bottom of the image. Last week, I posted Colormap Test Image to the File Exchange. It contains the function colormapTestImage, which does all this for you. 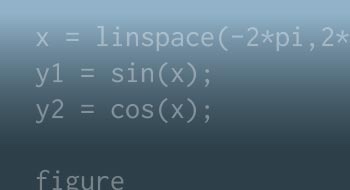 The function has another syntax, too. 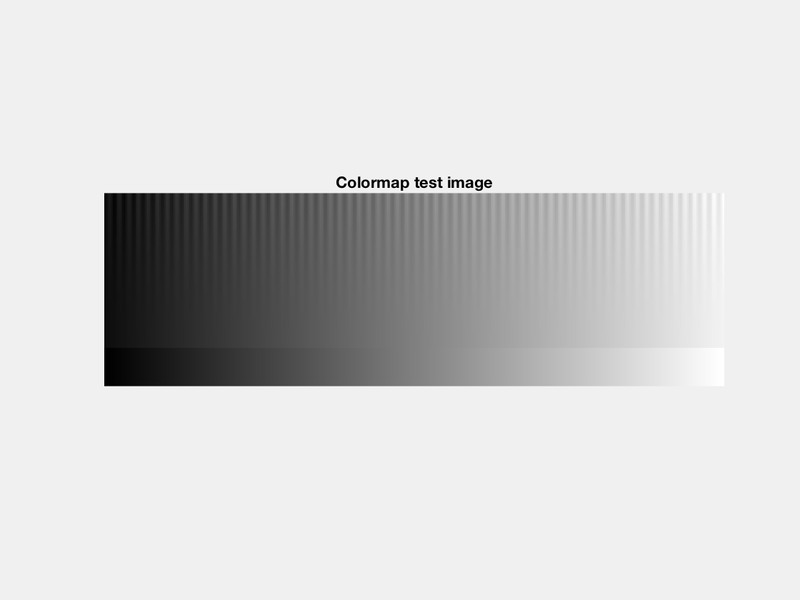 If you pass it the name of a colormap, it will display the test image using that colormap. For example, here is the test image with the old MATLAB default colormap, jet. This test image illustrates why we replaced jet as the default MATLAB colormap. I have annotated the image below to show some of the issues. Now compare with the new default colormap, parula. I think that illustrates what we were trying to achieve with parula: perceptual fidelity to the data. Since I'm talking about parula, I'll finish by mentioning that we need some very subtle tweaks to parula in the R2017b release. So you can compare, I'll show you the original version that shipped with R2014b. Readers, can you tell what is different? Let us know in the comments. This is another excellent review in the colormap series. 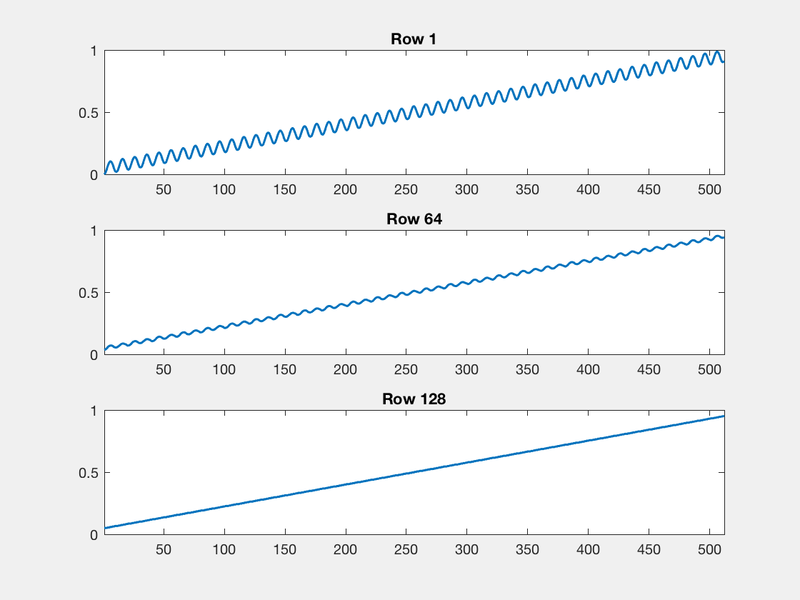 All those little—but important—details make the appearance of Matlab figures much better and more professional. I have definitely learned a lot. Keep up the good work! Regarding your question about parula. It went almost unnoticed in the Matlab release notes. The new version looks better, but I could tell the difference only after reading this blog: it has vivider and better contrasted colors. To me, this is a positive change. Yaroslav—Yes. One complaint about the original parula was that the region about 60-70% up the scale was relatively dull. We bumped up the "colorfulness" of that region, as well as the bottom region. We also subtly tweaked the overall perceptual uniformity of the scale. This demonstrates well the advantages of parula vs jet. But i still tend to use jet more often, for 2 reasons: 1. Parula highs are to bright, and it is somtimes annoying to see them on a white background. 2. Jet has more colors (thre reds), and while parula might be better for fine diffrerences, you can say that jet is more efficient in the sense that it is not "wasting" good colors. Is it not possible to create a colormap that takes the advantages of each? Tom—I have seen various attempts to create a perceptually improved rainbow (jet) colormap, and I did not think any of them were very good. 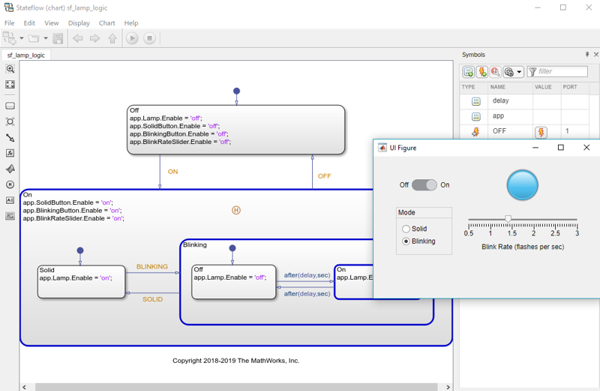 Using all available hues is possible and useful for some purposes, such as visualizing data with periodicity. However, using a dark-to-bright scheme for improved perceptual cues is fundamentally incompatible with using all hues. It isn't possible to have a one general-purpose colormap that works well for every data visualization scenario. I hope that at some point we will provide a better family of colormaps so that you have multiple choices available for your own needs. @Steve and Tom: The cubehelix colormaps (https://www.mathworks.com/matlabcentral/fileexchange/43700-cubehelix-colormaps--beautiful--distinct--versatile-) are perceptually monotonic (albeit not exactly perceptually linear) and provide more dynamic range than parula. Stephen Cobeldick has cleverly designed his cubehelix function to allow you to enter maximum lightness if you're concerned about the lighter end blending in with a white background. Or you can clip the high end of any colormap a la: col = parula(300); colormap(col(1:256,:)) It's worth noting that parula's yellow can be tough to see on a white background on a computer monitor, but it's often much more distinct when printed. Unfortunately, if you optimize for one, the other suffers. 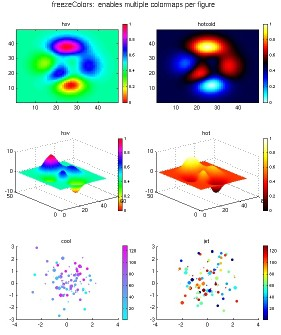 On Kovesi's MATLAB code page (just google it) you can download functions to create lots of different perceptually uniform color maps. omg, another totally unnecessary change of defaults. Parula? Seriously? Looks horrible - together with font smoothing and other totally unnecessary butchering of tried and proven matlab defaults. Tito—I missed the original notification of your comment, and I just now noticed that it was still waiting in the moderation queue. I'm sorry for the extended delay. The default MATLAB colormap changed three years ago, in the R2014b release. We made the change after a steady accumulation of evidence that convinced us that jet wasn't the ideal for general-purpose visualization. For a more detailed explanation, see my series on the topic (part 1, part 2, part 3), as well as my annotated bibliography on the issues with rainbow colormaps..